That became our refrain today. Grant and Wilson trying to take seriously whatever Jose/George/Jorge has to say! Yesterday – at the botanical gardens – we met a guy, who we thought was associated with the gardens – his name is Jose, or George, or (horhay) – who knows. 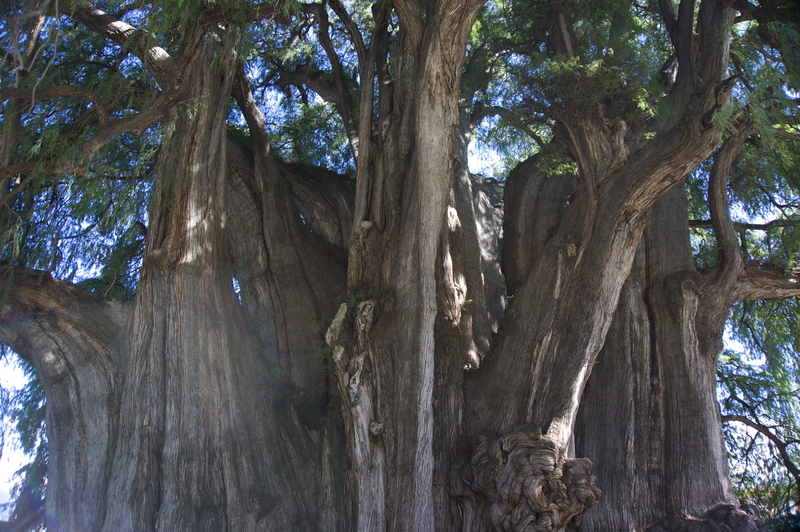 Anyway, he presented like he was part of the garden group, and then offered a tour to Teotitlan del Valle (weaving village), El Tule (2000 year old tree), Mitla (archeological ruins), and Hierve el Agua (calcified waterfalls). All this for the princely sum of 100 pesos each. Too good to be true??? Not a doubt. We would never have undertaken such a tour if Grant wasn’t as experienced as he is at all these places. In the morning, at the appointed time, there was Jose – not quite with the same vehicle he presented yesterday, but an adequate Ford escape. Some other guy was driving. We got in the car and wondered where on earth Jose was. Then we heard rustling. Jose was in the back cargo area, sitting on the straw. 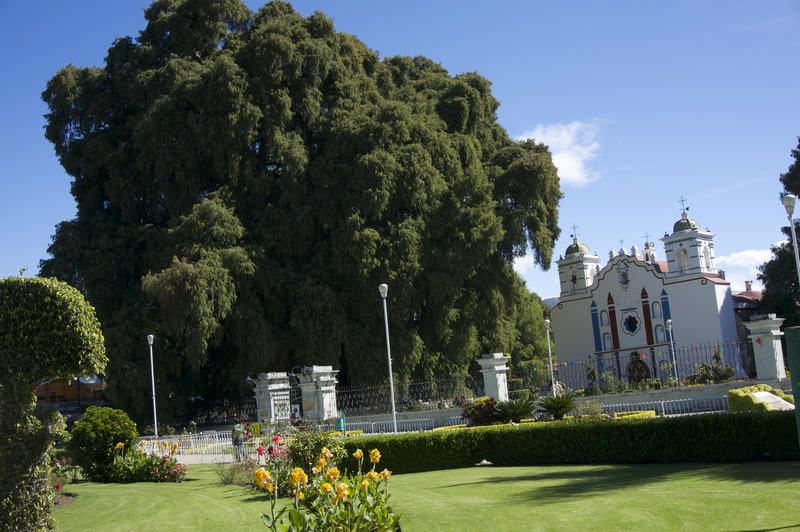 :o) Only in Mexico …..
Our first stop was at Arbol del Tule – this massive tree is more than 2000 years old and literally dwarfs the cathedral next to it. The town itself was so clean and quiet – quite beautiful. Incredible the way this 2000 year old tree dwarfs what is a really large cathedral. Back into the car and off to Teotitlan del Valle. This town is well known for its weaving. 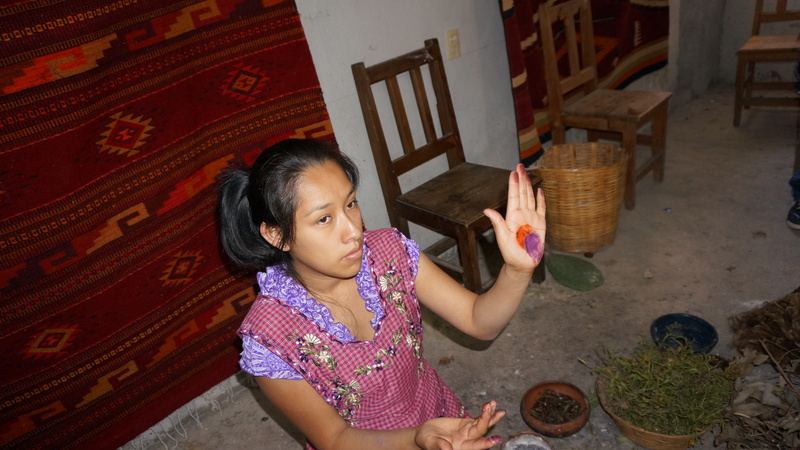 The Zapotecs that live there work all the weaving in the age old traditional way. We learned about how they first card the wool before spinning it, then dye it with all the old fashioned methods, using bugs and plant materials for colour. Just a couple little cochineal bugs create a deep maroon colour – add a little lemon and it is orange in colour, add a little limestone and it is purple! Walnuts to deepen brown, other herbs and plants to create greens, and the indigo plant for blue. Wouldn’t you know it – our driver had taken us to HIS house. His wife did weaving demonstrations for us, and another guy was working on a much larger loom. The weavers family had 2 children – ages 4 & 1 – pretty cute playing there. The four year old has decided that he doesn’t want to go to school, he would rather just weave and has his own loom already. A perfect red – the cochineal bug provides the perfect base to create so many shades in the red family. You can really see the lack of tourism with fear of travel in Mexico. They explained how so many of the indigenous people are suffering, along with the larger tourism aspects. Needless to say, Vivian and I were sucked in and each bought a rug …. in spite of the fact that we will be back in this village on Friday. 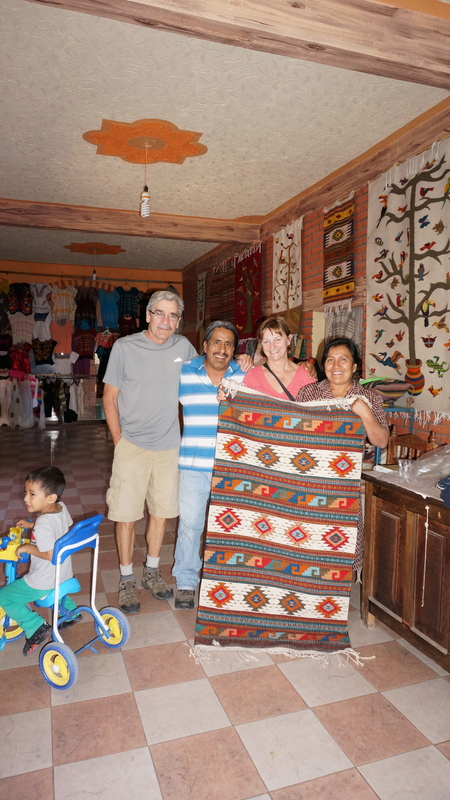 Vivi and Wilson with their weaving purchase – joined by the matriarch and patriarch of the home – Raoul is the one who ended up driving us to Mitla and Hierve de Agua. 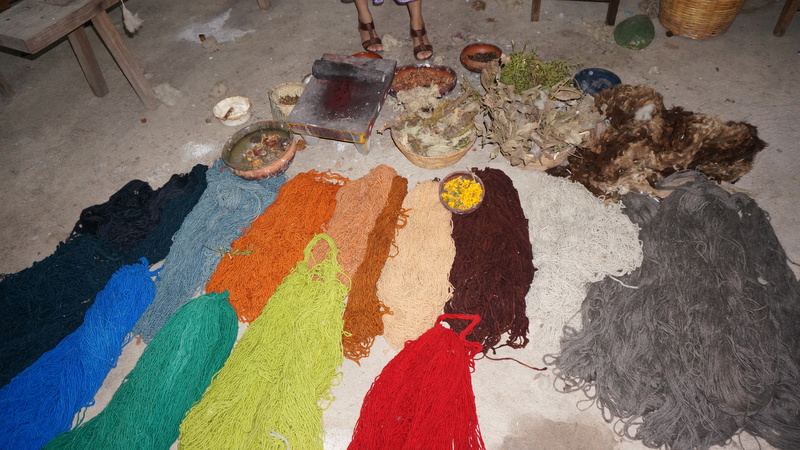 Just a sample of a few of the colours used in the weaving – all made with natural elements of their life. 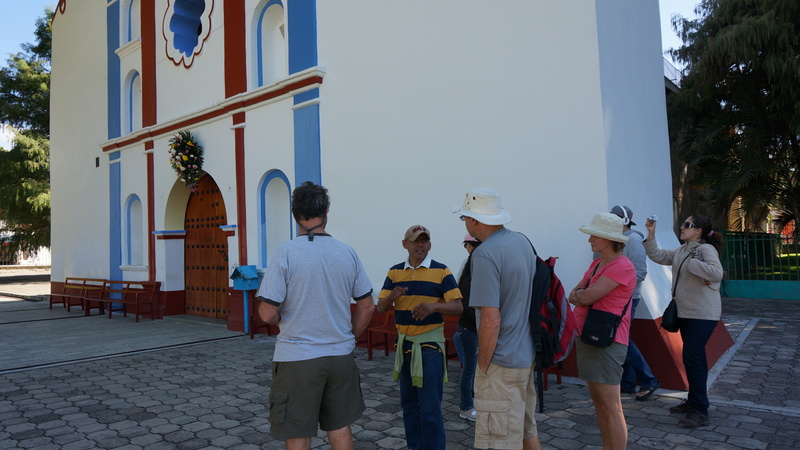 Our next stop was Mitla, and our driver stayed with his family while his father (Raoul) drove us on to Mitla. This archeological site was occupied as recently as the 1500’s by the Zapotecs. Once the Spanish arrived that was over, and they proceeded to destroy the site in order to build another cathedral and attempt to convert the natives to Catholocism. 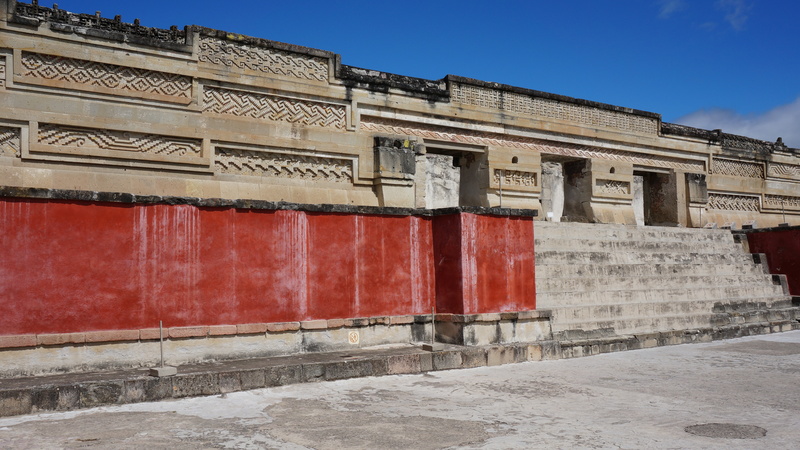 Mitla – it is amazing how vivid the red is, and so easy to imagine how impressive this whole place looked at it’s prime. 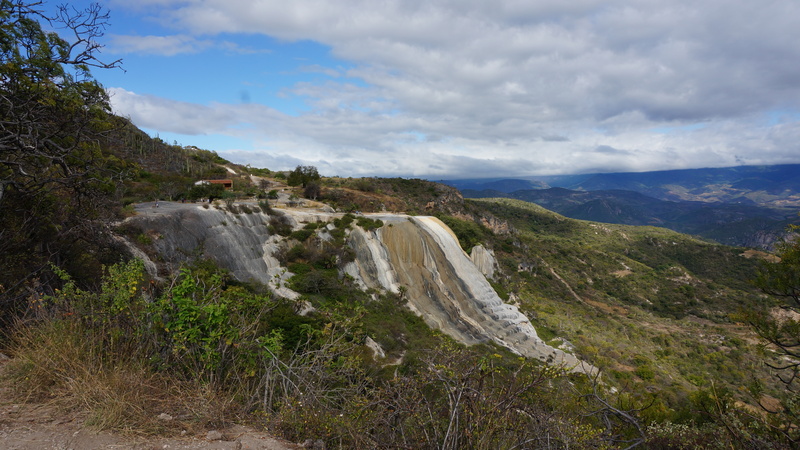 We had intended to carry on to Hierve el Agua – a calcified waterfall just beyond Mitla. Jose pointed out road closure signs and said the whole road was closed. Grant didn’t quite believe this, so he checked at the archeological site with another guide who said that no, they couldn’t close off the road to the village …. it was just the new highway wasn’t open yet. The roof of the cathedral behind the ruins. 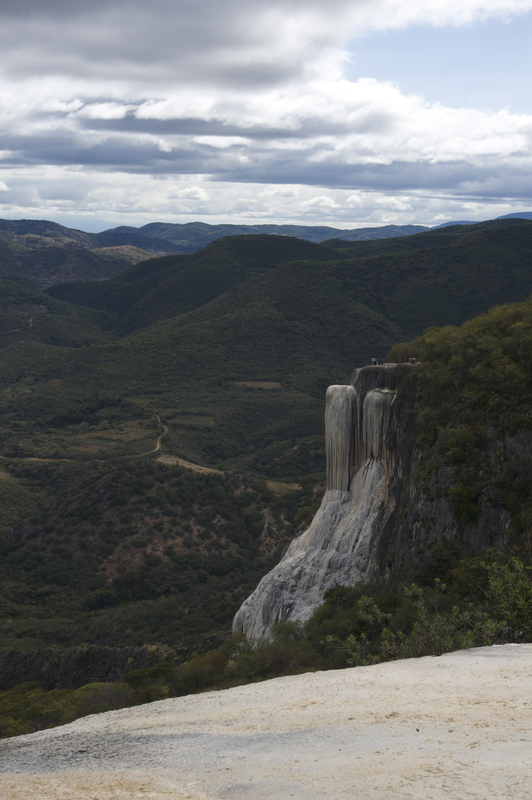 So when we got back to the car and Jose said that we were going back to Oaxaca because the waterfall was closed, Grant pointed out that no it wasn’t – we just had to take the other road. Poor Raoul (who kept calling Jose George) had apparently only been contracted to take us to Mitla and back to Oaxaca. 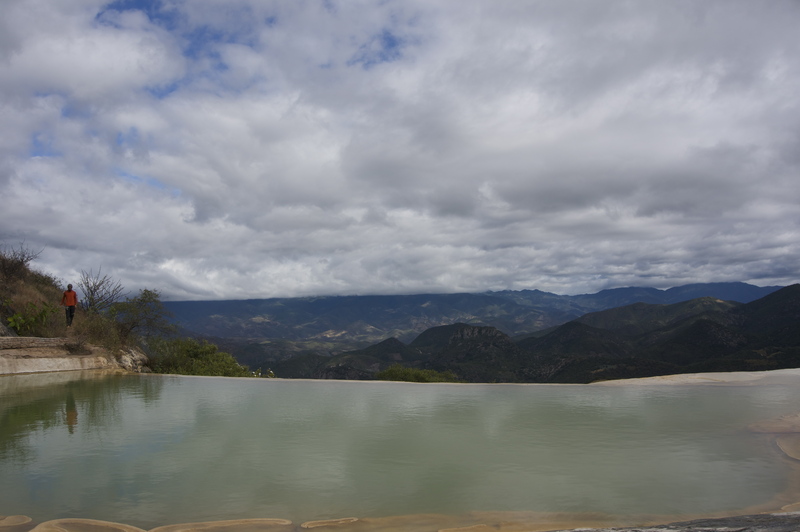 It was another couple of hours on the road before we got back to Oaxaca. And let me tell you – what a road. Up and down and up and up and up and around some more. Eventually we snaked our way through roads with Jose having to tell Raoul every turn to make as he hadn’t been there since he was a small child. 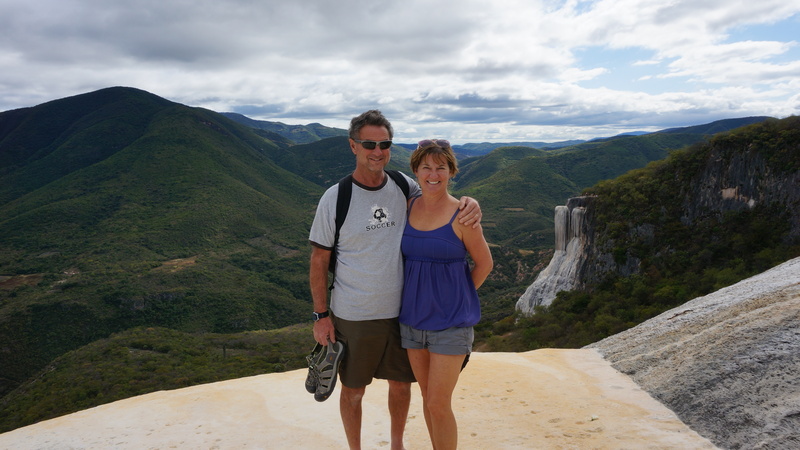 Honestly it was well worth it – those calcified waterfalls were incredible – such an amazing sight. Hope my photos do it justice. An ancient version of an infinity pool – although you sure would NOT want to go over the edge in this – not sure where you would end up. The calcified water is so green, and a very rich site against all the mountains. I don’t know how far down this goes, but if you slipped at the top, nothing would stop you …. and you know there is nothing to prevent you from slipping! Standing on one of the calcified areas, with more of the falls in the background – can you tell how nervous I am to be standing there? The entire mountain ranges behind the falls seem like they are the perfect frame. Such a remote area, and there are little villages everywhere dotting those hillsides. Raoul literally coasted back into town on gas fumes as he had no idea he was heading out to the falls. We had many a laugh as Grant and Raoul joked about making Jose push. First gas station we saw, we treated Raoul to some gas – he certainly put in the effort for it. We all kept saying “No way Jose” when he would try to tell us something …. In the end, the tour was more than worth the money we paid for it – so interesting and entertaining! Tonight on our evening walk down to the zocalo we noticed that protestors had arrived by the busload, so so many – so we skirted those areas on our way back home. Safely tucked in to a very quiet neighbourhood. 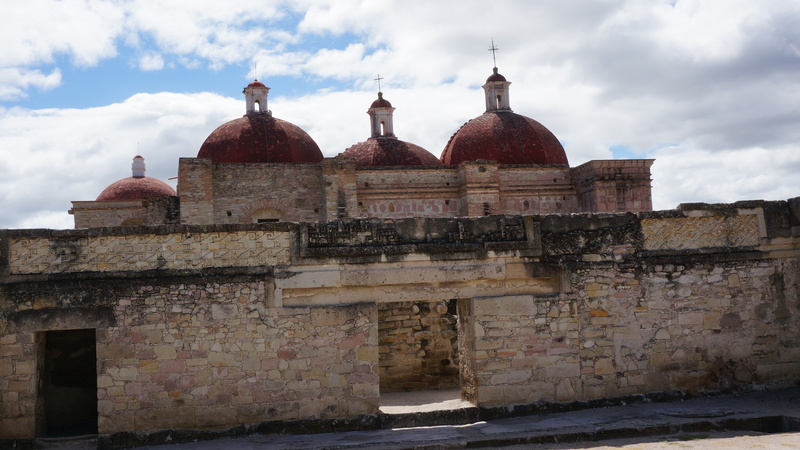 This entry was posted in Mexico, Travel and tagged adventure, Hierve del tule, Mexico, Mitla, Oaxaca, Teotitlan del Valle, travel by Chatty Kathy. Bookmark the permalink.